If you desire a straighter smile, there are different types of braces to help you achieve the smile you want. 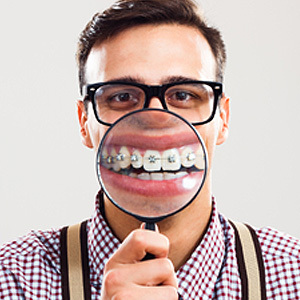 Whether you have gaps between teeth, a misaligned bite or teeth that are crooked, there are different types of braces that can correct those problems and transform your smile. Your dentist can help you determine which type of braces will best suit your needs. At Williamsburg Family Dentistry, Dr. Rick Rubin and Dr. Brett Dunnill are your dentists for braces in Williamsburg, VA. Braces are an orthodontic method for correcting misaligned bites and straightening teeth. There are several different types of braces, including traditional metal braces, ceramic braces and lingual braces. There are different benefits associated with each type and they are all good options for helping adults and teens achieve a straighter smile. In Williamsburg, braces of all types can be installed. Each type of braces utilizes brackets and wires to move and straighten the teeth. The brackets and wires for traditional metal braces and ceramic braces are applied to the fronts of the teeth. The primary difference between the type is that traditional metal brackets are silver, while ceramic brackets are clear and much less noticeable. Lingual braces differ from metal and ceramic braces in that the brackets and wires are mounted on the backs of the teeth. Each type of braces offers distinct benefits. Traditional metal braces are an affordable option delivering reliable results. Ceramic braces are an excellent option for individuals who desire less noticeable braces since the ceramic brackets are clear. Lingual braces are the most discreet option as they are applied to the backs of the teeth where they cannot be seen. With lingual braces, no one will even know you are wearing braces. Braces can help you achieve a beautiful, straight smile. Whether you choose traditional metal braces, clear ceramic braces or discreet lingual braces, each type offers different benefits and will give you the smile you desire. For braces in Williamsburg, schedule an appointment with Dr. Rubin or Dr. Dunnill by calling Williamsburg Family Dentistry at (757) 345-5500.